Henry Fleming, a raw Union Army recruit in the American Civil War, is anxious to confirm his patriotism and manhood—to earn his “badge of courage.” But his dreams of heroism and invulnerability are soon shattered when he flees the Confederate enemy during his baptism of fire and then witnesses the horrible death of a friend. Plunged unwillingly into the nightmare of war, Fleming survives by sheer luck and instinct. 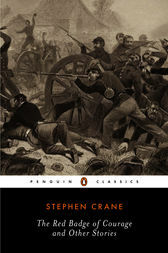 This edition of Stephen Crane’s poignant classic is supplemented by five of his acclaimed short stories as well as selected poetry, offering the full range of this great American author’s extraordinary talent.